This month we would like to congratulate the Plum Creek Rangers 4-H Club for being awarded the Nebraska 4-H Club of the Month for February 2017. 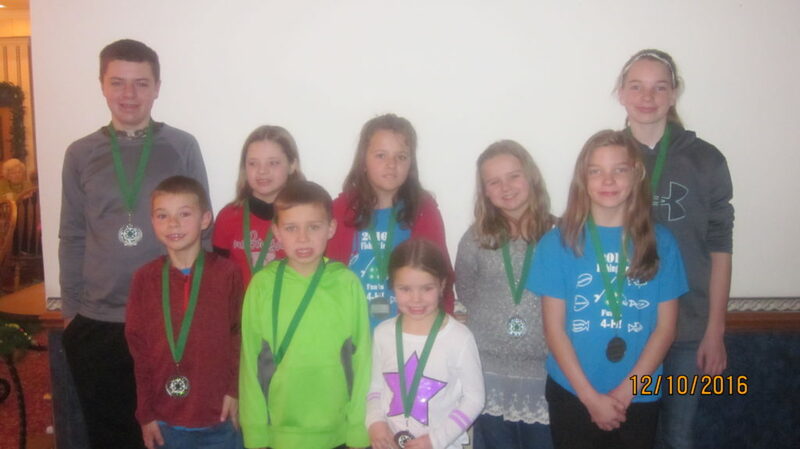 This 4-H Club from Johnstown, NE in Brown County has truly made a difference in their community. The club is very dedicated to building strong citizenship and teamwork through various community service activities. The Plum Creek Rangers have sixteen members, ranging in age from 5 -16 years old. The club meets monthly, with each family hosting a meeting. As each family hosts a meeting, they provide the snack and activity or project. The club meeting begins with members reciting the 4-H pledge, 4-H colors, 4-H motto, and 4-H creed. The club has learned the parliamentary procedure through club meetings. Currently eleven members are participating in the Diamond Clover program. The Plum Creek Rangers volunteer at the local assisted living center by playing BINGO with the residents at least three times a year. Members are required to bring prizes to the BINGO date for the residents to win while playing the game. Members also sit with the residents and enjoy conversation together as they get to know each other. Members of the club also individually volunteer during the year by providing craft activities for the residents. The Plum Creek Rangers also participate in service projects by decorating Valentines for Veterans, which are sent to veterans in Veteran homes or hospital facilities in the state of Nebraska. Five club members are also making quilts for local veterans. This project allows individual members to get to know more about our local veterans and their service experience, while giving them a special quilt in appreciation of their service to our country. The club also host the annual Easter Egg Hunt in Johnstown. This has been a tradition for at least five years. The members of the Plum Creek Rangers enjoy 4-H projects including sewing, baking, rocketry, robotics, gardening, wielding, wood projects, quilting, livestock and animal (cattle, pigs, goats, sheep, rabbits, and chickens) projects, livestock judging, public speaking, demonstrations, and fashion revue modeling. No Comments to "February 2017 Club of the Month"